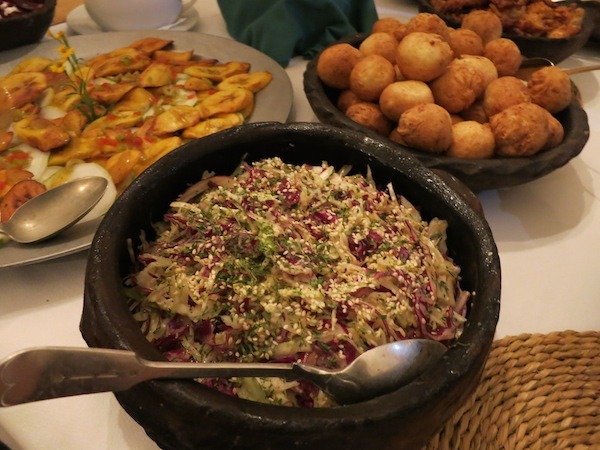 Nevis and The Hermitage - Feasting in Paradise - Ambassadors of World Food Tourism. 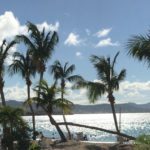 We’re always looking for unique and memorable experiences to share with you and our recent visit to the dreamy Caribbean Island of Nevis and stay at The Hermitage plantation estate fit the bill perfectly. Disclaimer: We were invited guests of Nevis Tourism and The Hermitage. We were not financially compensated and the opinions expressed are based on our own experience. 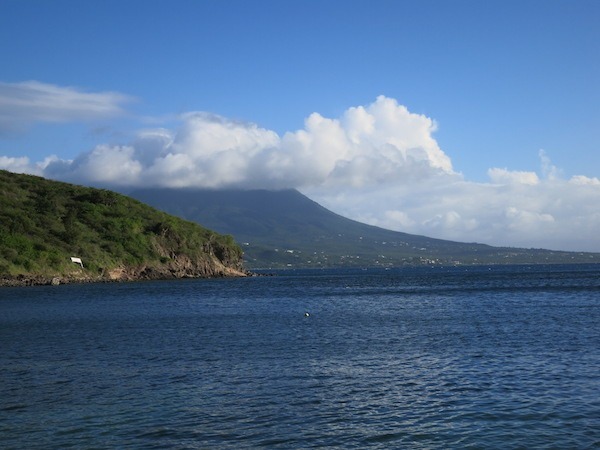 If you don’t know, Nevis is one of the most peaceful and serenely beautiful islands you will ever encounter. 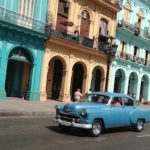 There are only some 11,000 inhabitants, so the atmosphere is uncluttered and relaxed. 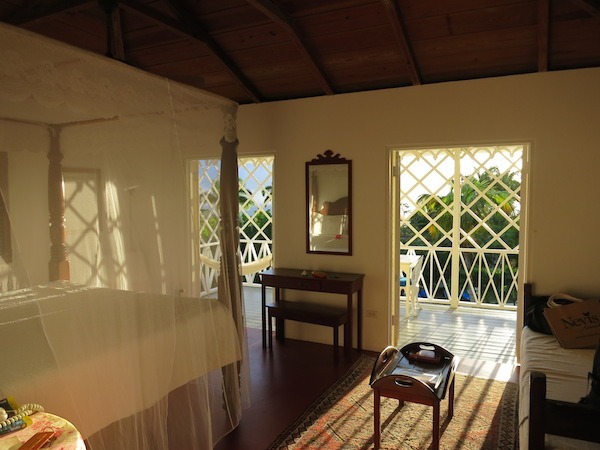 The petite Nevis, which is partnered in nationhood with the larger, more commercial St. Kitts, is about all about understated luxury. On an island where spiny lobster is one of the native dishes found just about everywhere, how could it not be? 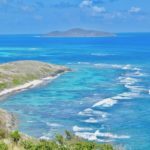 You will likely fly into St. Kitts and then take a water taxi (7 minutes) or a ferry (45 minutes) across the 2.5 mile channel between Nevis and St. Kitts. 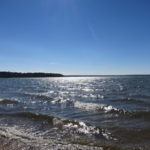 One interesting event occurs on the last Sunday of March when the ambitious athletes of the area do a Channel Swim between the two islands. 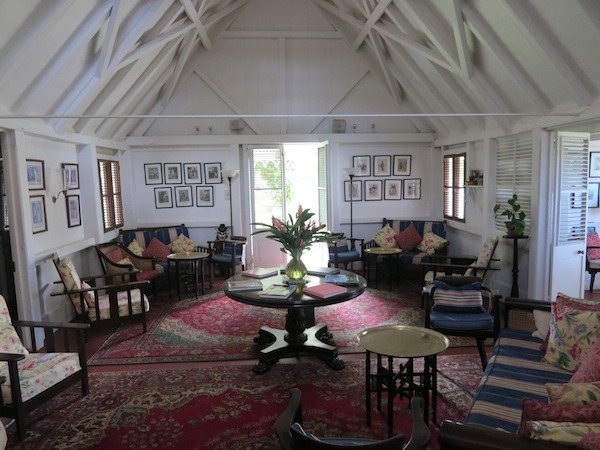 While on Nevis, we stayed at the Hermitage, a plantation estate with a fascinating history. It is believed that the Greathouse of The Hermitage is oldest existing wooden house in the Caribbean, having been likely built in the mid 1600s. The Lupinacci family of Philadelphia purchased the land, restored and rebuilt, and the cottages, dining porch, Great Room and other areas are as charming and comfortable as can be. 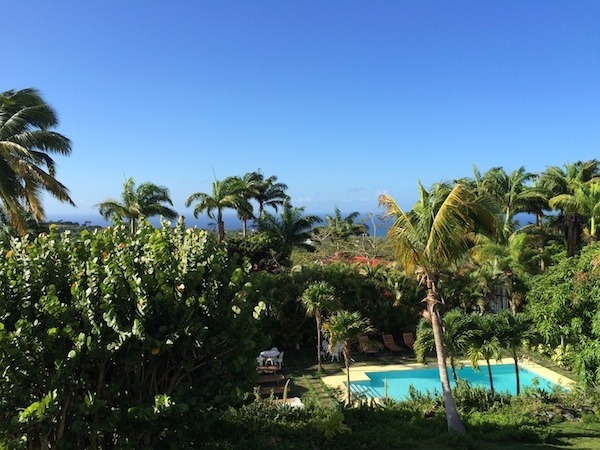 The resort is nestled up on a hillside, and there are spectacular views all the way to the sea. Lush gardens surround the Hermitage Plantation. 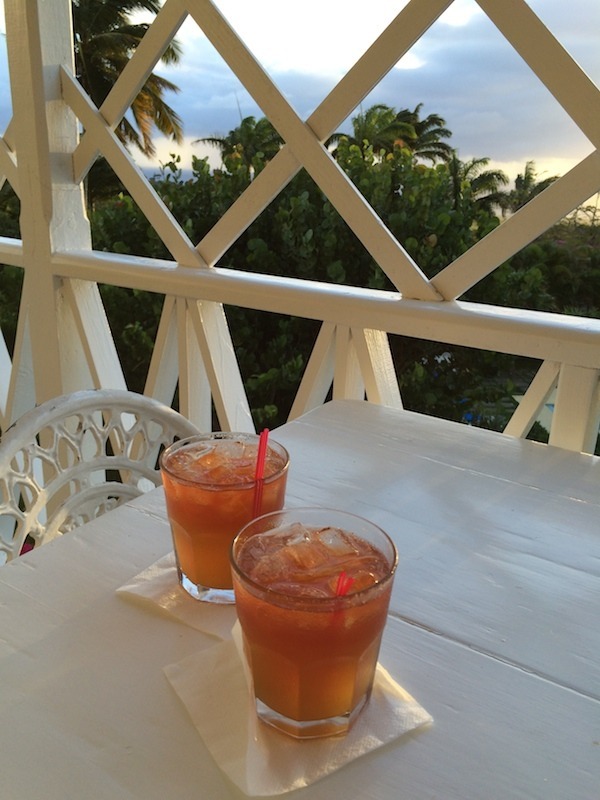 Shortly after our arrival at the Hermitage, we were greeted with the Hermitage’s signature drink, a delicious rum punch that is made from a 350 year-old recipe. We had to do some sipping and gazing out the window to take it all in. Our room was the upstairs one of a two floor cottage, with a lovely balcony on which to relax and enjoy the sunsets, which are also quite beautiful. The ocean breeze fills the room at the Hermitage Plantation. Richie Lupinacci is a friendly and informative owner of the Hermitage, and he was delightfully thorough in answering our many questions about the island, the plantations, the culture, and, of course, the food of Nevis. Contrary to many experiences you might have in other Caribbean settings, the Hermitage is so personal that you feel as though they’ve been excitedly waiting for you to discover them. And, so we did! 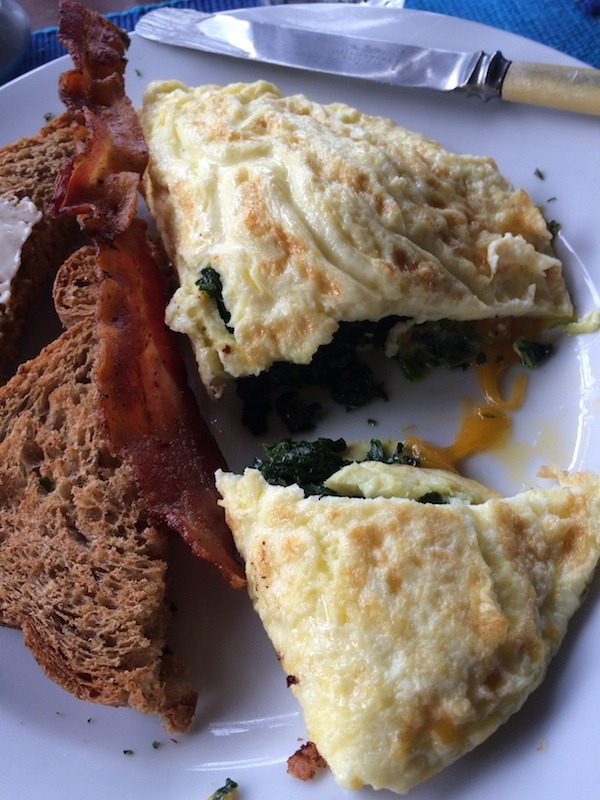 You instantly feel at home at the Hermitage Plantation. The Hermitage resort itself is quite rustically charming. There are no televisions or radios in the room, but there is free wireless Internet (a big plus!) in the room and main areas of the plantation. 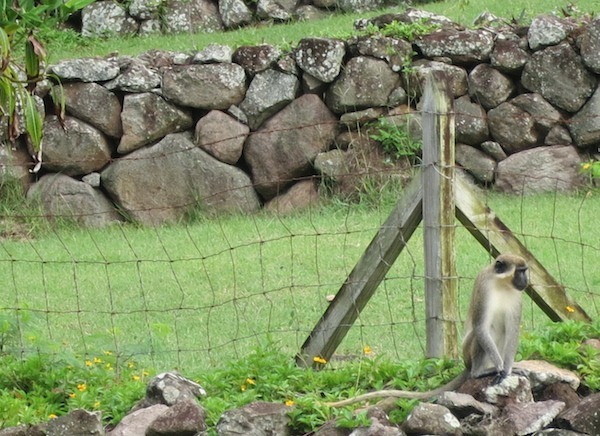 Carefree wild monkeys cavort on Nevis. Some frisky wild monkeys cavorted in the background, but we didn’t hear much of them. A nearby rooster welcomed in the dawn, and we were able to experience the sunrise over the Caribbean with palm trees swaying and surrounding greenery. It was, in a word, breathtaking. The charm of Hermitage Plantation is everywhere. Nevis has a low-key elegance that is difficult to find. It’s understated luxury, like a favorite cashmere sweater that has been keeping you warm forever. But, for us as food travelers, as much as we love atmosphere, we need to taste the food. And on that score, The Hermitage absolutely soars. We would fly back in a heartbeat just to experience it again. Yes, it’s that good. For starters, the dining area is the outdoor Verandah. A roof offers protection in case of rainy season, but otherwise you can view the lush grounds and wooden cottages while you eat. At breakfast your server will offer you coffee or tea with your menu. Then there is a small buffet with fresh juices, including unique “golden apple” that is found only in this area, yogurt, scratch made quick breads like carrot or ginger, fresh fruit and muesli. That’s just the beginning! Then for main dishes there are choices to please everyone, prepared by local cooks, and using mostly local ingredients and techniques. The Hermitage uses a traditional wood-burning oven, the only one on the island. If you’re going for protein, you can have eggs how you like them and bacon – please note, this was some of the most delicious bacon we have ever tasted – and scratch made toast and jam. 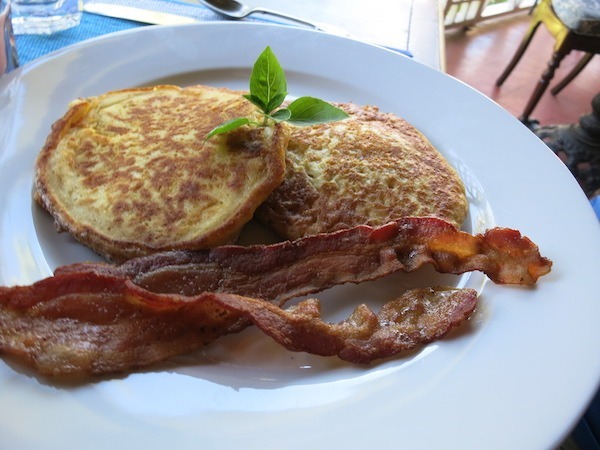 If you want something really special, they have seasonal pancakes, in our case, pumpkin, which were delightful. 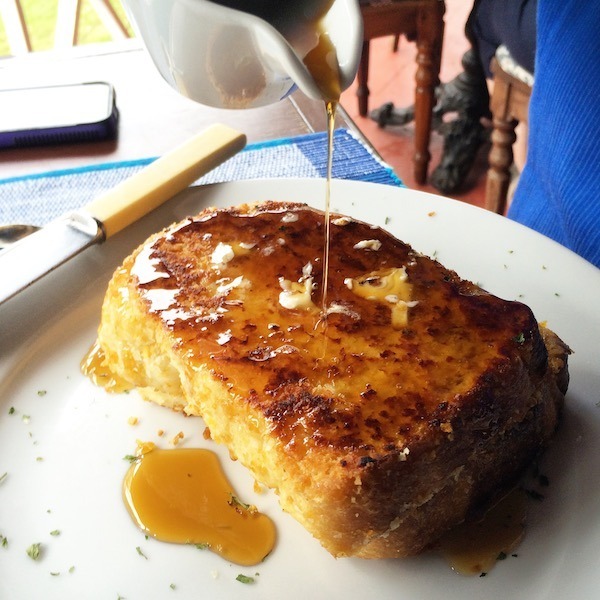 But to hit the highest mark possible, the coconut french toast, sent us swooning. We’re still dreaming about it now as we write this. We were in hog’s heaven from the beginning. But let’s not overlook the inevitable show-stopper at The Hermitage – the Wednesday Pig Roast and West Indian Buffet. Talk about a unique and memorable experience. This was one of our favorite evening events ever. 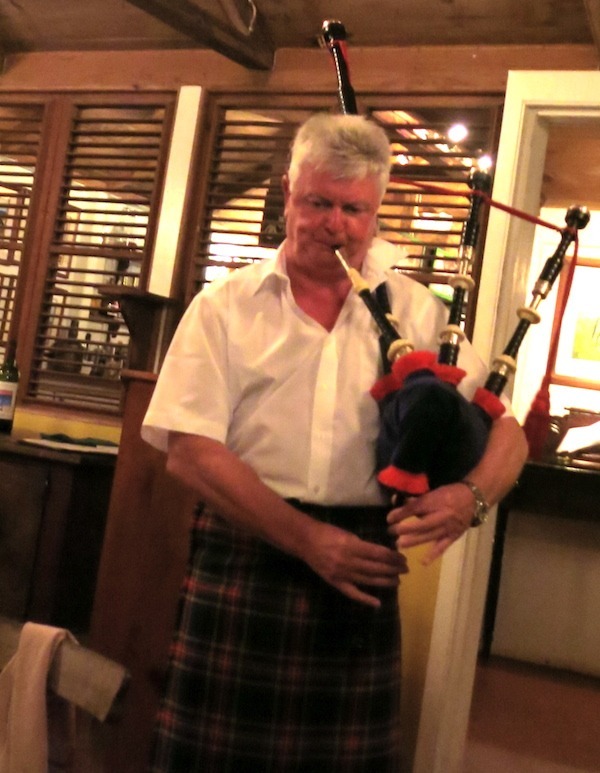 In our case, it was started by a visitor, Bob from Scotland, a return visitor who had brought along his bagpipes to welcome guests to cocktail hour before the dinner. He was fun and colorful, and we also had an opportunity to meet others attending the dinner while enjoying rum punch and other libations of our choice. In addition to the spit roasted suckling pig, which can be seen sizzling away all day, there are delicious recipes, including many local ingredients that offer a huge variety – even for vegetarians. Some of the more unique dishes we tried included a variety of slaws and salads, chickpea stew, plantains, bbq chicken, sweet yams, curried Mahi Mahi (a local fish), bbq and our favorite, starchy, cheesy breadfruit. There were more dishes than we can remember as well as dessert, and it was beyond our expectations. The Hermitage also offers lunch, which you can have on the Verandah, or if you wish, by the pool, where you can sit and sun yourself or take a dip. There’s also an afternoon tea and rum punch served in the Great Room or outside. It’s all most civilized and really delightful if you’re looking to enjoy some real signs of relaxation. 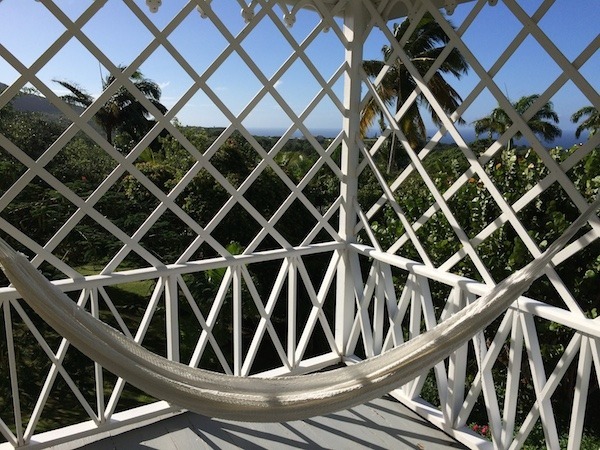 If you’re looking for a different Caribbean getaway, one that is rustic and elegant, luxurious without attitude, personal and relaxing, and for us Food Travelists, absolutely delicious, you will want to explore Nevis and visit The Hermitage. You can learn more about the Hermitage Plantation and book reservations on their website. 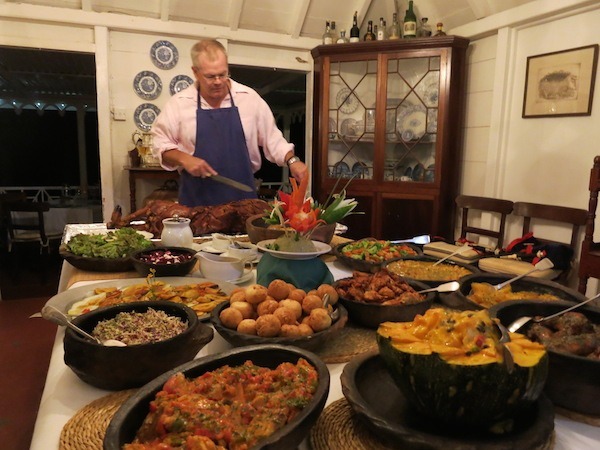 THE QUICK BITE: For a unique and memorable Caribbean experience with delicious food and personalized attention, check out the island of Nevis and The Hermitage plantation estate. Loved this post. In 1986 we stayed at the Hermitage. 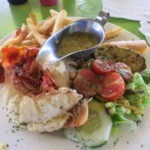 When we were last in Nevis in 2012, we did not stay there but did visit for the Wednesday night Buffet. There had been a lot of changes to the places, including new cottages. But the Great Room remained much the same and the place still had the same easy charm. I loved this post. In 1986 we stayed at the Hermitage. 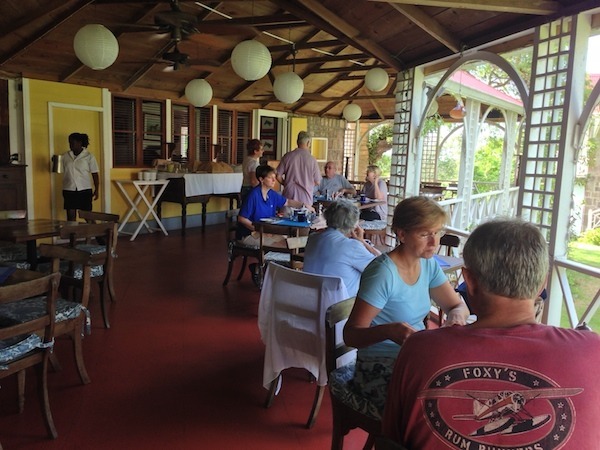 When we were last in Nevis in 2012, we did not stay there but did visit for the Wednesday night Buffet. There had been a lot of changes to the places, including new cottages. But the Great Room remained much the same and the place still had the same easy charm. I’ve never been to Nevis. This looks like a great place to stay at a great destination! You made me yearn for Paradise. Nevis looks fabulous. 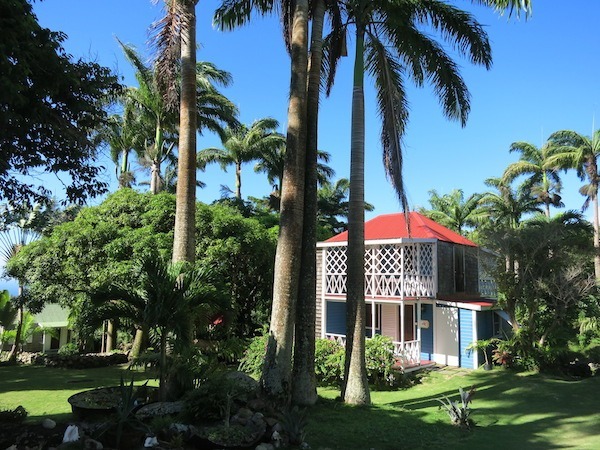 Someday I hope to get to Nevis and stay at the Hermitage plantation. I want me some of that lobster and rum punch and I’d love to see the monkeys! Princess Margaret loved Nevis for its privacy and understatement (although she didn’t seem like an understated kind of gal, did she?). This looks absolutely wonderful. I’m sure it’s as dreamy in real life. Beautiful. 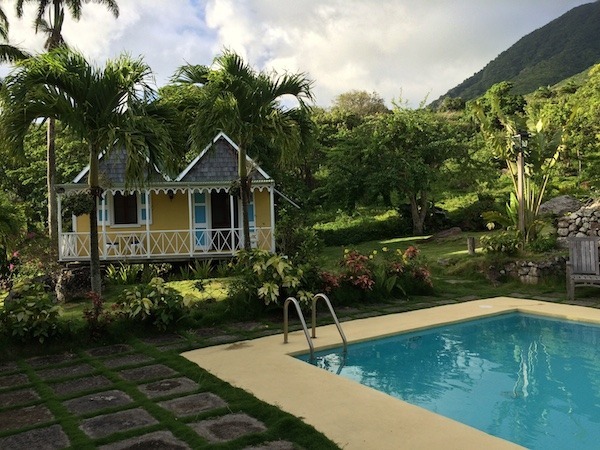 Nevis is truly a little island gem. Thanks for stopping by Betsy!